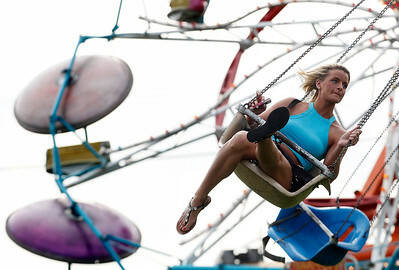 Matthew Apgar - mapgar@shawmedia.com Melissa Simpson of McHenry kicks her feet out while riding on the Tilt-A-Whirl swings at the Fiesta Days celebration on Friday, July 10, 2015 at Peterson Park in McHenry. 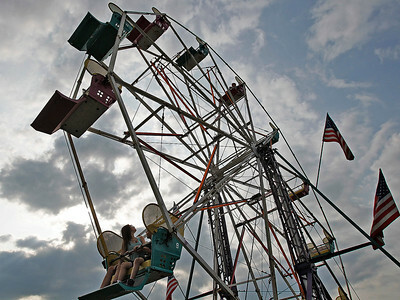 Matthew Apgar - mapgar@shawmedia.com Haily Schneberger, 14, left, and Kyle Berggren, 10, both of McHenry, ride on the ferris wheel during the Fiesta Days celebration on Friday, July 10, 2015 at Peterson Park in McHenry. 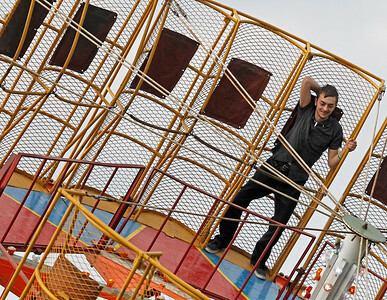 Matthew Apgar - mapgar@shawmedia.com John Gittings of McHenry, 20, finds a comfortable position to relax in while spinning around in the Zero Gravity ride at the Fiesta Days celebration on Friday, July 10, 2015 at Peterson Park in McHenry.